"Foolish Mom" is about the conflicts and reconciliation with a mother whose intelligence becomes lowered by an accident. The daughter looks at her mother differently after giving birth. Kim Young-Joo (Kim Hyun-Joo) is a fashion magazine editor. Her husband is Jung-Do (Kim Tae-Woo), a law school professor, and she one daughter named Dat-Byeol (Ahn Seo-Hyun), who has an IQ of 200. Kim Young-Joo appears to have everything, but her life is a mess. Her husband has an affair and asks Young-Joo for a divorce. Her daughter blames Young-Joo for their marital problems. Kim Young-Joo also has a family she wants to forget about. Her older sister Sun-Young (Ha Hee-Ra) is mentally slow and her older brother is a troublemaker. One day before her magazine deadline and her birthday, Young-Joo is busy at work. She gets a phone call from Dat-Byeol's professor. Dat-Byeol erased a file for a team project done by university students and Dat-Byeol. Young-Joo goes to pick her up. Dat-Byeol complains that the other students talk behind her back about their impending divorce. Dat-Byeol is angry at the other students and her mom. When they get home, Young-Joo sees her husband coming out of a room. Jung-Do came home to find some paperwork and didn't inform Young-Joo. Jung-Do also brought Chae-Rin (Yu In-Young), the woman he is having an affair with. Dat-Byeol is happy to see her dad, but when Young-Joo is alone with her husband she becomes furious at him and tells him that won't get a divorce. Meanwhile, Young-Joo's older sister Sun-Young decides to prepare food for Young-Joo's birthday. Sun-Young has not seen her younger sister for a couple of years. When Sun-Young gets to Young-Joo's home in Seoul, Sun-Young sees a house that looks different from the last time she was there, but she is sure it is Young-Joo's home. Drama series is based on the novel "Babo Umma" (literally "Foolish Mom") by Choi Yoo-Kyung (published October 28, 2005). 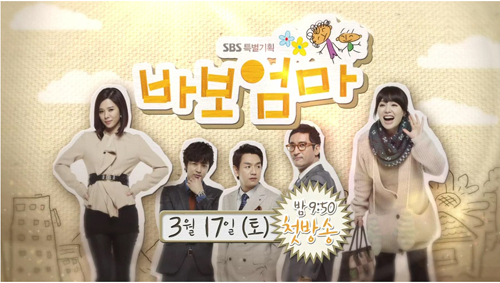 "Foolish Mom" takes over the SBS Saturdays & Sundays 22:00 time slot previously occupied by "Live in Style" and followed by "Gentleman's Dignity" on May 26, 2012.